How would you rate your experience with LG Electronics ? LG Electronics was founded in 1958 in South Korea, originally as “GoldStar”. The company manufactures and distributes a wide range of appliances and consumer electronics around the globe. GoldStar merged with “Lucky” and LG Cable to found what today is LG Electronics. The company plays a large role in the consumer appliance and electronics world. It is the second largest LCD television manufacturer in the world, and recently released the world’s first 84-inch ultra-HD television for sale to consumers. The company also makes mobile phones, computers, smart watches, tablets, vacuum cleaners, washing machines, and refrigerators, just to name a few of their products. LG Electronics announced the availability of its latest premium, high-performance LG gram notebooks for the first time this year, which had received high praise earlier this month at CES 2018. The new 15-inch model is designed for users who want a more powerful performance from their notebook. In April 2018, the company announced that they were adding Hulu Live TV to selected smart televisions. LG made the Forbes list of Best Employers in 2018. Although the company is based in South Korea, the company has established a corporate office in New Jersey. 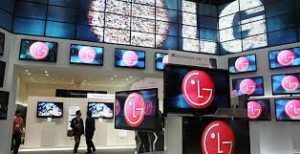 LG Electronics had annual revenue in 2015 of $56.5 trillion and employ almost 82,000 people. Question 1: What is the phone number for LG Electronics? Answer 1: The phone number for LG Electronics is (201) 816-2000. Question 2: Who is the CEO of LG Electronics? Answer 2: The CEO of LG Electronics is Cho Jun-Ho. Question 3: Who founded LG Electronics? Answer 3: LG Electronics was founded by Gold Star in 1958. The worse customer service I have ever seen ! All the people before me are not exaggerating their experience! I sent in a 2 year old projector for repair. I had to send it back 3 times ! Finally , they told me they ‘ auto destroyed it ‘ they told me they would replace the unit or issue a full refund. Well , neither has happened. They kept the unit and refuse to tell me anything ! I am ready to spend what ever it takes to teach these criminals a lesson ! I can’t believe these losers are still in business. Tell everyone you encounter to never do business with these idiots ! I think LG makes the worst appliances every created. I purchased a refrigerator, dishwasher, microwave and oven all LG five 1/2 years ago. I have had to replace the microwave and the new one has had three repair visits already. I also have had the dishwasher repaired twice (approximate $320) the stove once (covered by warranty) and the refrigerator twice (total parts $827). I would advise anyone NOT to buy LG. Their repair service requires that they charge your credit card BEFORE the visit! Stay away folks, the products are bummers. I am a senior citizen with meager retirement funds. On 2/13/2016 I purchased a LG-V10 smartphone. Yesterday the battery started to overheat and I could not use the phone anymore. I understand that you were aware of this problem, so I am requesting some reimbursement. I spend $672.00 and only could use the phone just over two years. That is outrageous. I will NEVER purchase another LG product again!!!!! I purchased a refrigerator model number LFXS30726S in April 2016. The compressor died in October 2018. This piece of crap cost us $2,475 and lasted us a little over 2 years. I have been on the phone with this company at lease once a week since October 28, 2018. It is now December 1, 2018 and have received no service. They keep telling me that they are looking for a service rep to come out in my area and fix it. They haven’t found anybody to fix it after 5 weeks. I am pretty sure they never will. I have even gone as far as trying to find a repair person myself but nobody wants to fix LG or Samsung products. They have all told me that their compressors are too hard to fix and the tools to fix it are costly. I then received a message on my cell phone on November 12th informing me that it was taken to the “escalation process”. They also said that if they were unable to find a repair person in 3 to 5 business days that they would find an alternative solution (refund or replacement). Never heard from them after the 5 day marker and I called them back. In fact I have called them back at lease once a week from the time that I was promised a resolution on Nov 12th and as you can guess they still don’t have an answer as of December 1st. If they tell you it is going to escalation, it just means they are trying to appease you and buy more time. As mentioned in the other reviews, they push you to your last limit and just hope that you will go away. I truly don’t understand how LG stays in business because not only do they build a product that costs a fortune and doesn’t last for more that 2-3 years, they also have horrible customer service. In my eyes they are criminals!!!! They steal the money from the consumer and walk away not standing behind their product. Not sure how they sleep at night but I will sleep a lot better getting the word out that they are a company that consumers should not support. We’ve had the same problem with our range. It was delivered broken, that was 6 months ago, they are still trying to find a repair person, even though they know no one will service it. They Tols us they will replace it, now we can’t get anywhere with them. They always say they will return my call. They never do. The worst customer service!!!!! I will totally agree with this statement. My fridge went out on Xmas eve and it’s mid feb now and I still have gotten no where with this company. It’s flusterating as all get out. They only saving grace we have is we have snow banks to keep our stuff cold. So flusterating. Linkedin is a good source of names, titles and profiles for management at any company. Read a person’s full profile and find out what they do and what is important to them. There are websites which list email domains at companies. Once the domain is known; sometimes email addresses for the contacts found in Linkedin can be determined. When you send an email and it does not “bounce back” ; you know you have it correct. When you have the names; you can also start calling direct to managers. Call as if you are a business person. Speak as if you know them and reference something you know about them ( which you read on Linkedin) and then ask them to help you referencing what you saw on Linkedin. Also; ask an Appliance store that sells the product for the direct contact info. for the people they deal with. If you get contacts; list them here for others to contact. If you want to get personal; cross check a person found on linkedin on Facebook. Two weeks ago we came home to a flood in the kitchen. The refrigerator quit, the freezer had thawed down all food was lost.We called LG because we have only had it a few years to verify the warranty. Never received a call back, until today. A woman said I’m calling about your refrigerator to let you know it is under warranty and we will fix the problem. I said are you calling about the message we left two weeks ago? She said yes. I told her we had to buy a new refrigerator, (not LG), and toss the LG. She said “sorry”. Long story longer, after checking LG has a poor at best customer service rating. They have great features and look but if something goes wrong and you can’t get service what good is it? I can NOT believe this company is in business. If people knew how POORLY (and that is being generous!) they respond to service calls, let alone get someone to your home to fix the machines, they’d NEVER sell another piece of equipment again. Our refrigerator is less than 12 months old and it completely stopped working! I’ve tried for over a week calling the main customer support line, then LG Electronics in AL, and finally the CEO’s office in NJ and have STILL not had a repair service call initiated. It’s been over a WEEK now and still NO appointment for repair. Absolutely, unacceptable. I’m writing a letter to the CEO of Best Buy to share my experience and encourage them to NOT sell any LG products until LG takes seriously their responsibility to SERVICE their products! What a joke of a company! Bought 65 inch Tv had problems with it on day one. Spoke with customer service for help with set up. The rep determined I needed the Magic remote with voice activation that did NOT come with the tv. She stated she would mail it out to me Free of charge. One week later I received a remote in the mail that was the same remote that doesn’t work with this unit very well. When I called LG to ask they replace the remote as they had promised they refused and said I could purchase it for $83.00. I reminded that they had promised to replace it at no charge and it was actually doXXXXented. They said their employee was mistaken and they would not replace it final . Very rude customer service.I am returning TV. Do NOT BUY LG PRODUCTS EVER!!! I have called customer care on January 22nd, in which I provided the receipt of the product purchased from Sam’s Club. Today, February 5th, 2018 I called 1:17pm inquiring my missing parts to the washer side-kicker. The customer care agent stated that my receipt needed to provided the model/serial number. I have provided whatever Sam’s Club receipt shown. Upon my frustration, I’ve requested to speak with the manager on duty, the customer care agent told me the manager would not speak to me. My experience with LG customer care have been a frustrating and time consuming. Please resolve my matter as soon as possible. Same issues with our LG refrigerator! Called customer service 5X with no result. I purchased a warranty on our dryer on 9/29/17. At that time I scheduled an appointment to have our dryer repaired. My wife received a call from the service center saying that the company could not come out but another company would come and she was given the phone number. She called the company and the owner told her that they don’t repair gas dryers. My wife told her that our dryer is electric. The company made an appointment to come out to repair the dryer. My wife read the warranty and saw that it said gas dryer. She called LG and spoke with a representative and asked that the warranty be changed from gas to electric so that we don’t go through that problem again. She was told rather rudely that it could not be changed. She asked to speak with a manager. The person asked why. She told him it was because she wanted the information corrected. He hung up on her! She then called someone in another department and asked to speak with a manager in service and was put on hold. No one ever came to the phone. I then went on a live chat and the person was able to help get the information changed. I explained the rude treatment we received and told him I was going to report it to corporate. He typed “alright” and cut the chat off. Since we had that original issue saying we had an electric dryer and we had purchased a one year warranty, I would like a correct copy of the warranty mailed or emailed to me reflecting that we do have an electric dryer. I purchased washer model WT5001CW in December 2011. The inside of the rim is very badly rusted and the enamel is blistering all the way around. Large chunks of rust fall into my wash and ruin it. Your robotic customer service agents were absolutely no help, as I am sure they are programmed to deflect all complaints. LG manufactures the worst products (I also have defective dryer, refrigerator & TV ), has the worst ‘customer service’, if you can even call it that and has absolutely no respect or concern for their consumers. After seeing the enormous number of complaints for every product you make and the utter lack of responsibility you take I am shocked that you can remain in business. I am committed to discrediting this terrible company in every possible way so that others may be spared the expense and immense frustration of dealing with a company who makes really crappy products and could care less while they laugh all the way to the bank. Absolutely feel for you and there r a million others they have treated this way. Shout your story loud and clear social media news networks whatever it takes they have made trillions from our consumers and have no concern to stand by or fix their product and the other non LG companies don’t want to work on them as they do not get reimbursed sufficiently. File complaints with all you can reach we don’t need companies like that taken advantage of consumers. Many spent many years worth of savings on their products only to find out either parts or repair are impossible no service etc. I hope they are banned from sale and I hope the retailers quit asking them as they can be liable too as these products are not fit for providing the service they are supposed to and are expected to perform the function they are sold for. Don’t believe you have no rights! Implied warranty is not just a one year and you pray the thing doesn’t stop working and can’t be repaired. Demand it fulfill it’s fitness for service $4500 for fridge and repairs and they want another $1,700 for labor to fix a warranted part? I don’t think so! When action is filed it will be for a whole lot more for all my grief and lost good many times and improper repair. Now they believe they will hold out not repairing till warranty runs out. LG is so awful! Please do not buy their products!!!! Purchase a LG washer and dryer from Sears, they were a matching pair when delivered but the dryer had to be exchanged because of the exhaust configuration. The dryer was out of stock so we had to wait for it to come back in. When it did it was a different color than the wash machine, no longer a matching pair. LG’s rep told Sears to call and LG would correct the problem, but when I did they refused. I was told that once the Kenmore name goes on it, it is no longer a LG product but rather it belonged to Sears, even though it was still an LG. Sears and LG are playing the blame game as neither one wants to own up and take care of the problem. Have. LG phone that is no longer supposed in up dates . LG leaving my home with out protection app to control system no long supported . Bad move on their part! LG has horrible customer service and horrible products. I will never buy LG again. I have owned a LG G3, G4, G5, and 2 HBS Bluetooth headsets. The only product that has never needed repair is my G2. My G5 has been sent back 2x and left me w/o a phone for 4 weeks. I just received it and it came back with no speaker. Now it has to go back again for 2 weeks, a total of 6 weeks w/o a phone. LG does not care, will not waive expedited shipping, and will not offer a loaner device. Never again will I own a LG product or give this company any positive feedback. I am done. I’m going to buy a Samsung or Nexus phone today. I would just like it to be known that the lack of care by the service dept, is the reason that another long-time customer is leaving your company products behind. Hopefully this email can be given to someone of authority and changes will be made. Also each time I contact LG (by chat, email, or phone) I’m told I cannot speak to a supervisor. I’ve made too many phone calls and product claims with this company to rely on the product again. Bought a LG French Door Refrigerator three years ago. The freezer went out last week. Called an independent repairman since my warrenty was up and was told there was a Freon leak. Was told the refrigerator was not cooling up to par either. Called Customer Service where I got transferred three times by three poorly speaking rep’s and was told I would have to pay $325 to have it repaired and it would come with only a 60 day guarantee. Because I need this appliance I agreed and had to give a credit card for them to chg the service. I have not received a date for this repair but they have already deducted a third of the cost from the account. Every time I mentioned I couldn’t understand what they were saying due to their accents I was transferred. Their customer service is one of the worst I have ever had to deal with and their product is sub par. I have written a letter to them, cc’d the letter and sent it to BBB,Home Depot where I bought it, LG’s headquarters, put it on Facebook and my twitter account. I am getting ready to put it in the paper in the Opinions Column. My advice is run not walk away from any LG product because if you have a problem their worthless customer service isn’t going to be of much if any help. Absolutely feel for you and there r a million others they have treated this way. Shout your story loud and clear social media news networks whatever it takes they have made trillions from our consumers and have no concern to stand by or fix their product and the other non LG companies don’t want to work on them as they do not get reimbursed sufficiently. File complaints with all you can reach we don’t need companies like that taken advantage of consumers. Many spent many years worth of savings on their products only to find out either parts or repair are impossible no service etc. I hope they are banned from sale and I hope the retailers quit selling them as they can be liable too as these products are not fit for providing the service they are supposed to and are expected to perform the function they are sold for. Don’t believe you have no rights! Implied warranty is not just a one year and you pray the thing doesn’t stop working and can’t be repaired. Demand it fulfill it’s fitness for service $4500 for fridge and repairs and they want another $1,700 for labor to fix a warranted part? I don’t think so! When action is filed it will be for a whole lot more for all my grief and lost good many times and improper repair. Now they believe they will hold out not repairing till warranty runs out. LG is so awful! Please do not buy their products!!!! I agree with the “Run from ZLG products as others have said. Please if you think we are doing this for fun you are sorely mistaken. You don’t want to end up here. HORRIBLE!!!!!!! I have a 2 1/2 year old LG french door refrigerator that has been dead for one month and have gotten the run around from LG for the past month.The compressor needs to be replaced but no service people in Ct. want to do warrantee work for LG. They sat they don’t get paid yet LG site lists all these “LG certified techs”. Their customer service is nil and they don’t stand behind their product. They are ripping us off. Just look up their customer service complaints. BUYER BEWARE! It’s a disgrace! Have bought G3, it stopped working 1.5 years later (6 months after warranty), bought a G4, same thing happened. Company said it was under warranty, shipped it back, company changed their minds, it’s not under warranty. We spent, time, money, bought a flip pgone to get us through the 10 days that they have it, it’s been over 3 weeks, still haven’t received it. They want us to pay for repairs on their mistake. 3 headsets that have not worked after 6 months. A TV that has the screen getting darker. We would have never sent the phone back if it could’t be fixed. We would have bought a new phone instead of spending $200 on shipping, new phone, losing all our data. Piss, poor customer service. Heard there is a suit against LG for software issues, count me in. LG won’t make this right. I been waiting for over a month for a repair for our refrigerator.. We have been trying to get this repair with no avail.. They keep giving us the run around.. beware pray you never need a repair.. the worst customer service ever! We are having the same problem with our refrigerator. It’s been out for a month and all we get is the run a round with customer service. Do you have any suggestions? My LG refrigerator stopped working after 2.5 years. Have tried for almost 4 months to get them to send the compressor.The repairman has been trying too. They give you a case #- I’m on my 3rd. Case # expires after 30 days. Repairman & I have called ridiculous # of times. Contacted a lawyer doing a class action suit. Rec’d an answer stating they weren’t going to pursue it now & that LG is dedicated to customer service. Right! Bought it at Home Depot – got different cust. serv. # from them. Goes straight to same place as other #. Rprman called US person-get nothing but lies. Guess I’m going to have to file a class action myself if I can find a lawyer to do it. Pls let me know if anyone finds out how to get this thing done. I’m tired of waiting and we need to do something about this beside complaining online. Can’t afford another fridge. Thanks. Wanted to add this- I did not buy the extended warranty. Your warranty is only good for 1 year for labor and functional parts. However, the compressor warranty is good for 10 yrs. & condenser for 7 yrs. I’ve grilled them on it all so don’t give up even if you didn’t buy the extended warranty. Oh, and the smart phone thing (sorry not tech savvy) at the top of your fridge, I tried that at the beginning before repairman called. That’s a joke too. Said door was open 1st time. Called back; had them do it again- it was the ice maker’s fault. These people take your money but do not care if anything happens after. Cust. Serv. is scripted and you can rant and rave all you want-will hear- “So sorry.” That’s all you get. for your LEED GOLD Construction Projects? I purchased the front load direct drive set a couple years ago and have had nothing but problems with my washer. Almost immediatly it gave me an error code te which is the thermistor . replaced them but still the code persisted and has never stopped after countless complaints & warrenty coming to an end problems have not stopped presenting themselves…from error codes to dnot recognizing the door being closed. & vibrations so intense that i cant put anything on the shared wall between the washing room & dining room due to items falling & having to “babysit this machine to ensure the cycle completes properly or risk my families clothes be tainted from sitting & washing & soaking in tainted “grey water” (as they are now) unsatisisfied is nowhere close to explaining my discontent with the company as a whole….i just want to return all my lg products take the $ ive wadted with them and start new with a company who doesnt just phase out customers like they do products. Want to make sure LG Electronics sees your comment or complaint?